** Originally published in July-August-September 1994 Abu Farwa issue of The Crabbet Influence magazine. Dominar #41240 (pictured above in the article/header photo at top of page) was foaled March 21, 1967, and was an integral member of the first foal crop bred by the Waltons of WWW Arabians of Corpus Christi, Texas, from their imported and quite breathtaking all Crabbet line stallion, *Golden Domino. 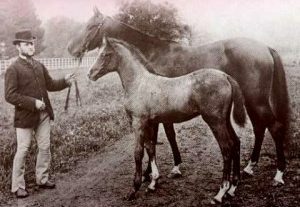 *Golden Domino was a son of Blue Domino and Crystal Dew (by Rifari out of Gleaming Gold by Indian Gold), and so possessed a truly royal pedigree, rich in the blood of the finest Crabbet lines. Dominar’s dam Arnatta, one of the Walton foundation mares, a daughter of Ronar and Ganatta (by El Nattall out of Gamafa by Gamhuri), a CMK pedigree. I first met Dominar as a yearling when he was being shown to many halter wins by Carol Chapman as a part of the WWW show string. He was then trained under saddle by the Chapmans and their associate, Judy Connelly. 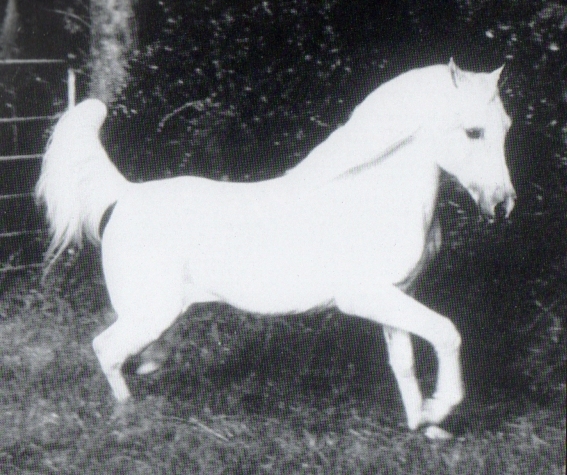 Dominar was originally shown as a stock horse and also in western and English pleasure classes under the ownership of my long-time friend, Marilyn Lang. As a two and three year old stallion, Dominar bred some lovely half-Arabian foals. 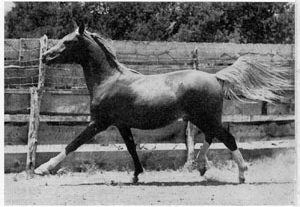 One of his foals became a regional top five halter mare as a three-year-old. When Dominar was five, I “took” him in order to ride and show hoping to improve my riding abilities. The family that owned the stable where I kept Dominar fell in love with this gentle, trained-to-perfection stallion, and purchased him from Marilyn for their 13 year old daughter. For several years, Dominar and his young rider made quite a team throughout Texas, Oklahoma, and Louisiana circuit, winning numerous titles in English pleasure, park and saddleseat equitation. Although he achieved many accomplishments as a show horse during this period of his life, his owners were not interested in breeding, and Dominar did not cover a mare for 12 years. Throughout his life, Dominar was blessed with good fortune. The initial memory I have of him was in 1971. 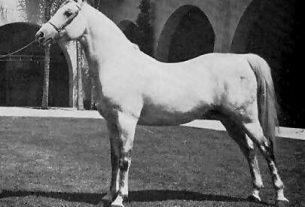 Marilyn had purchased a straight Egyptian yearling son of *Ansata Ibn Halima and was boarding both of her horses at a very exclusive and elegant facility. One morning I received a very distraught call from Marilyn with the news that her young horse had been killed in a ‘freak’ accident. It seems that the yearling horse and Dominar were on a newly installed hot walker when the machine shorted out. A bolt of electricity hit the young horse first and dropped him instantly. Luckily, the ranch foreman was nearby and witnessed the tragedy. He managed to run to Dominar, who was on the opposite side of the walker, hit the quick release on the halter shank, and took him off the walker prior to the circuit continuing on around! In the mid-seventies the family that owned Dominar fell on hard times, and his young companion left home. When I found my old friend in the fall of 1984, he was standing in a stall that was barely held together by ‘toothpicks’ so to speak, with mares running around him outside. He was a slight shadow of the stallion I remembered, but he still had that wonderful disposition, or special spark and style, that is uniquely his. I promised myself right then I would take him out of that environment and bring him back to good health again – hopefully to sire more foals. And I did! Dominar and I fought many individual battles over the years. Dominar fought against recurring bouts of colic many times, some requiring a vet’s attention, and some just needing many patient hours of home medication and WALKING. A hurricane once forced us to pack up and move to safety in a fierce wind and rain. In 1991 just when my hopes were so high for the future, I had a setback in my personal life; all of my horses except Dominar were dispersed. I then re-married, and what I had anticipated to be a ‘good home’ for both of us turned out to be just the opposite. We more-or-less became ‘recluses’ and thought we would live out our lives as such. However, my daughter Stefanie would not let that be! She reminded me time and again what a ‘treasure’ Dominar is, and how he seems to be much like a vision of Skowronek. I had to be sure that when I finally left that terrible situation, Dominar was taken to safety with me. Ten years have now passed since that fall day in 1984 when we found Dominar, and in addition to the various traumatic times, we have had some very happy memories. My family has had some wonderful foals by Dominar out of a variety of mares. In 1988, we welcomed the beautiful Bint Dominar, a purebred daughter out of a 94% Babson Egyptian mare. Topping the half-Arabians is Gallant Tyme, Dominar’s double-registered grey overo Pinto son who has many championships and titles for us, including a 1990 National Championship. His get all show size, extreme Arabian TYPE and style, as well as the wonderful disposition of their sire. Dominar certainly proved to us beyond a doubt, and through very limited use, just how prepotent he is as a sire. Yes, we do still ride Dominar. In fact, one of my fondest memories and proudest moments was when at the age of 21, Dominar went to his first show in many years, and carried my then 10-year-old daughter to a FIRST place in a very large western pleasure class. The show was held during a severe thunderstorm, with lightning and thunder crackling over the metal arena. Just about every other horse in the ring went berserk! Dominar is especially fond of little children, no doubt in part from the years of ‘teaching’ so many children to ride, and he handles them all with great care and wisdom. On the other hand, Dominar is still quite energetic and animated under saddle with an adult rider. We have used him many times to ‘pony’ our young horses (fillies and colts both!). To this day, he truly enjoys and looks forward to being saddled and taken out on the trails. It is eerie to read Lady Wentworth’s descriptions of Skowronek which so remind me of Dominar. And like Skowronek, his descendant Dominar was never given the opportunities he deserved. I truly feel that God has always had a ‘reason’ for keeping this wonderful creature safe with us in the face of adversity all these years. We are even more determined to ensure that a legacy is established from Dominar – particularly with offspring that are bred from similar lines. Dominar was just shown on March 1, 1994 (at approximately 12:15 p.m.) in the Arabian Freestyle Liberty Class (20 horses) at the Houston Livestock Show and Rodeo. His age was not announced, so many people did not know he was 27 years old. I am pleased to report that he literally ‘brought the house down!’ I thought we would have six or seven friends there to cheer for us; HOWEVER – once my daughter Stefanie entered the arena leading Dominar at an extended trot, removed Dominar’s show halter, and his music (God Bless Texas!) started playing, the old HAM put on a fantastic show. The ENTIRE audience supported him! We were so proud – we hadn’t really expected anything, so you can imagine how excited we were when it was announced that Dominar made the cut and was one of the six finalists for the evening performance! Dominar was exhibited again at 7:00 p.m. We feel he showed the longest and ‘floating trot’ of any horse there. He was somewhat tired and did not win the championship, but we were swamped with visitors to his stall after each performance, and many congratulations! Dominar really acted as an ‘ambassador’ for the Crabbet horses during the show. Although this adventure caused much worry and concern on my part, this noble stallion showed us all just exactly how deserving he is to be acknowledged a true ‘KING’ of equines! We will never forget this thrill of a lifetime. Dominar remains in wonderful condition today. He loves to show off, and also loves the attention of a crowd. We are honored to have had the pleasure of Dominar’s company all of these years, and wish to give the Arabian community a glimpse of history – the Arabian horse as he was meant to be, graceful, athletic, gentle – a delight to all who know, love and admire him.